Listening to interesting presentations from experts, encountering new ideas, chatting with old friends, and meeting new ones. This doesn’t have to stop in Atlanta: AMS local chapters provide the same networking opportunities and learning experiences all year long. Fortunately, the AMS Annual Meeting is a great time to find out more about them. 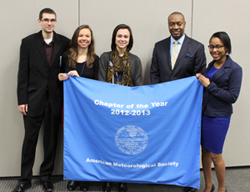 Local chapters have been a part of the American Meteorological Society’s framework almost from the beginning, with the first chapter formed in Boston in 1929. 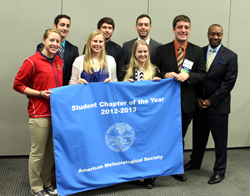 Whether you are a meteorology student or a professional, AMS chapters offer a superabundance of opportunities, from community outreach projects that further AMS goals, to engaging presentations from scientific leaders, to interactions with others in the profession. The likes of Louis Uccellini, director of the NWS; Rick Knabb, director of the National Hurricane Center; Ginger Zee, Good Morning America meteorologist; Bryan Norcross, Weather Channel meteorologist; and Bill Murtagh, program coordinator for the Space Weather Prediction Center have all captivated hundreds of members at local chapter meetings. This week at the Annual Meeting check out the Local Chapter poster display in Hall C3 and read about each chapter’s history and recent activities. You can also stop by the Local Chapter Booth at the AMS Resource Center in the Exhibit Hall (Booth 415) and take a look at a map showing the locations of each chapter. With 64 regular chapters and 74 student chapters throughout the US and Puerto Rico, there is bound to be a local chapter near you. If you are unable to attend the Annual Meeting this year, worry not. 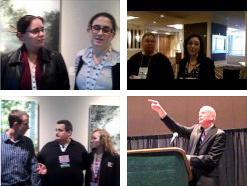 Visit the Local Chapter Website at http://www.ametsoc.org/amschaps/ for more information, the Chapter Facebook page at http://www.facebook.com/amslcac, or contact the Local Chapter Affairs Committee at amschaps@ametsoc.org. Congratulations to the Iowa State University chapter, the 2012-13 Student Chapter of the Year (above), and the North Florida chapter, the 2012-13 AMS Chapter of the Year (below).